It's back! The color blue hasn't been around much the last several years but now I'm seeing a lot of it lately for interior design, product design and fashion. After viewing some of the new introductions in fabrics recently, I can say that blue and white has made a comeback. 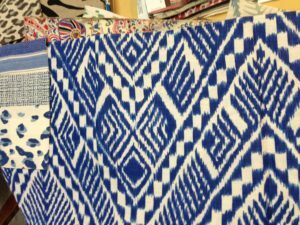 This tribal looking blue/white combo with coordinates was among the new introductions in interior design. Blue and white is classic, it's clean, and I'm glad it is back. Many colors coordinate beautifully with this color combo: reds, pinks, corals, greens, yellows. If you are looking to refresh a room, consider using blue and white with an accent color.